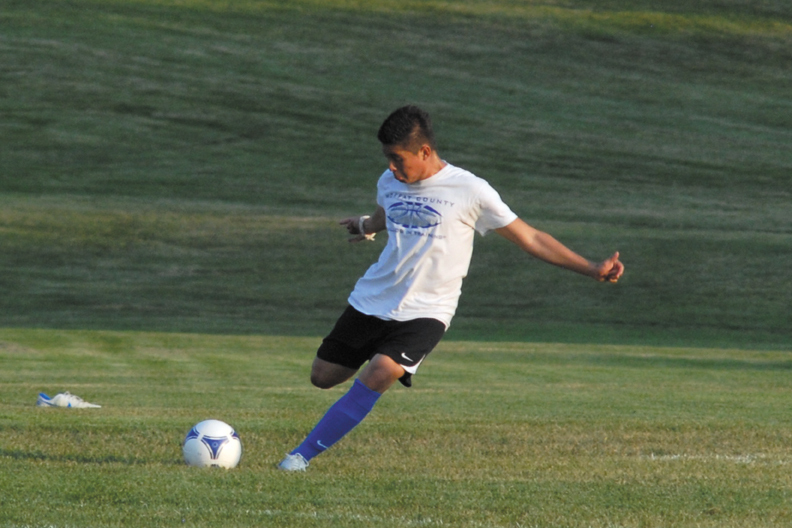 Nestor Arrellano, a junior at Moffat County High School, kicks the ball downfield during a soccer practice at Loudy-Simpson Park this summer. Arrellano is one of several versatile players returning to the Bulldogs this year. —Rusty Cox, MCHS boys soccer head coach, about playing against 3A teams this season. A grueling session of summer conditioning and skill work has the Moffat County High School boys soccer team primed for a big season. The team, which begins its season by traveling to Coal Ridge High School Sept. 4, has several contributing graduates to replace from last year’s team, but that’s a process head coach Rusty Cox has grown accustomed to. The boys team had a middling year in 2011, going 6-7-2 in the Western Slope League, but showed off its talent in certain games, including a 3-3 tie against Steamboat Springs High School, which went 13-3-1 last year. While MCHS still will play Steamboat once this year, most of the rest of the teams on its schedule are new. The Bulldogs moved to Class-3A from 4A this off-season. Cox said the only 3A league game against a familiar opponent will come against Roaring Fork High School. Seeing fresh faces will present a challenge for Cox as coach in helping prepare his players for schemes and styles he hasn’t seen. The players aren’t as worried. Senior Bryant Cox said many of the players will be familiar from outside the high school sports scene. Also new for the Bulldogs boys soccer team in 2012 is its scheme. Rusty Cox said he is planning to adjust his team’s alignment to better utilize its strong defensive players and talented playmakers. The idea is to take advantage of his top players’ strengths and give them a chance to create, he said. Those changes will probably be a work in progress. Due to the team’s low numbers, they haven’t been able to play 11-on-11 soccer in practice to get those systems rooted. Rusty Cox is not worried about his team as the season starts, though. He knows he has enough talent to get wins; it will be a matter of putting them into the right positions. With under a week to go until the season begins, players were ready to get on the field and showcase their abilities.